If you suffer from citric acid allergies, you have come to the right place. I am the Lemon Ninja and I will be your sensei. 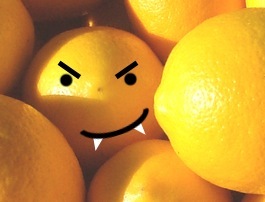 Your first lesson is simple: When life gives you lemons, RUN!!! There are many more important lessons for ninjas-in-training, so have fun exploring, and if there is anything else you’d like to see here, please let me know! The goal of this site is to be an informative guide for those seeking to avoid citric acid in their diet and environment, and I’d like to provide as much information, both scientific and ninja-tific, as possible.